Super Mario World 2: Yoshi's Island is a video game created by Nintendo for the SNES gameconsole released in 1995. SMW2:YI is a platform game as it's predecessor Super Mario World. In this game, unlike previous Mario platform games, the player does not control Mario, but instead controls a dinosaur called Yoshi. Yoshi was introduced in Super Mario World, as a buddy of Mario. In the game's introduction we see a stork on it's way to deliver baby Mario and baby Luigi to their parents. But Kamek, an evil magical koopa, intervenes and steals baby Luigi and the stork. Baby Mario falls down onto an Island called Yoshi's Island and lands on top of a green Yoshi. All the different colored Yoshi's then set out to get baby Luigi back from Kamek and his boss. As with most new Mario platform games, this game features many innovative levels and original gameplay. Yoshi can eat enemies and then convert them to eggs. These eggs can be used to shoot at enemies and various other objects in the game. Whenever Yoshi gets hit by an enemy, he loses Baby Mario. Baby Mario then goes floating in the air in a bubble. Yoshi has to get Baby Mario back before a timer runs down, otherwise Baby Mario is taken away by Kamek's buddies, and the player loses a life. After getting baby Mario back, the timer counts back to ten. The timer can be extended to 30 seconds by collecting stars in the level. The graphical style also differs from previous Mario games, by making it look as if all the graphics are hand-drawn with crayon. The game cartridge is equipped with a Super FX 2 chip which is used for various graphical effects, such as rotating, scaling, morphing, etc. 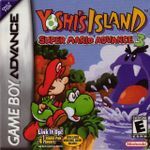 The game was re-released on the Gameboy Advance Platform with the title "Yoshi's Island: Super Mario Advance 3" in 2002.